Reading progress update: I've read 295 out of 295 pages. This contained everything that I have come to expect in a David McIntee novel. 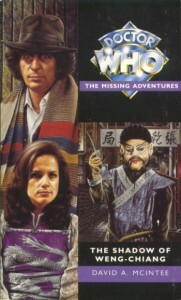 I also realized as I was reading it that this and two of his contributions to the Past Doctor Adventures series are all set in China, which is rather unusual and makes for a refreshing change of pace from the British-centric nature of most of the Doctor's adventures on Earth.